Colleges, recreational facilities and even some professional leagues increasingly choose synthetic turf fields over natural grass pitches for soccer. Synthetic turf consists of artificial grass blades stitched into a backing material and interspersed with black rubber beads and sand. Artificial turf solves many problems associated with natural grass turfs; however, some professional soccer players have spoken out against the use of synthetic turf. Lower cost and less upkeep constitute some of the major reasons why your local soccer field may consider installing artificial turf. Artificial turfs don't require mowing, and they require less maintenance in some situations. However, contrary to the popular belief that artificial turfs are cheaper to maintain, the Sports Turf Managers Association, or STMA, found that the upkeep of artificial grass can be more expensive. They calculated a yearly maintenance cost of around $14,000 dollars for a natural grass field, while the cost of upkeep for an artificial turf was almost $23,000 in 2009. Despite the upkeep costs, your club may turn a better profit on synthetic turf because it allows for more playing time. Artificial turfs allow matches to continue in all types of weather -- except thunder and lightning. Rainfall can cause clubs to postpone and even cancel matches altogether due to poor playing conditions and severe damage to natural grass fields. If your league plays on artificial turf, you won't have that problem. Artificial turf allows you to use a variety of footwear, including indoor soccer shoes or turf soccer shoes, a hybrid shoe that looks like an indoor shoe with bump-like treads on the bottom. Because artificial turf is made of synthetic materials, it does not tear like grass. It gives way upon contact with your soccer studs, thereby possibly causing abrupt or jarring stops. The STMA claims the hardness and non-resiliency of artificial turfs leads to greater injuries. However, FIFA’s study of the U-17 Championship in Peru in 2005 concluded there were very little differences in the incidence, nature and causes of injuries observed during games played on artificial turf compared and those played on grass. A flat terrain creates conditions for fast passing, while ruts, bumps, uneven grass or gradations disrupt the movement of the ball. You'll find these obstacles absent from an artificial turf. On a natural grass field, the pace of your game depends on the quality of the field -- the shortness of the grass cutting and how recently it was cut will make a difference. When the blades of grass are short, you can make the ball travel faster. On a synthetic field, you can rely on consistently short, even grass. Even though moving the ball faster on artificial turf may seem ideal, some professional leagues, such as the English Premier League, refuse to use artificial turf. Some professional players are against playing on artificial turf too. In 2007, soccer celebrity David Beckham of the Los Angeles Galaxy refused to play against Toronto FC at Toronto’s home stadium because of its artificial turf. Because artificial turf is flat and harder than real grass, the ball tends to bounce high when it hits the ground, catching you and your fellow players by surprise. Dry weather, however, can cause natural grass fields to harden as well. While artificial turf may not live up to a top-notch natural pitch, some natural grass fields with poor maintenance can exasperate players. Turfs, on the other hand, contain millions of black rubber beads scattered throughout the turf blades that soften impact. If your artificial turf is outdoors, these little beads heat up like asphalt on a hot sunny day. When this happens, the playing surface will feel hot on your feet. 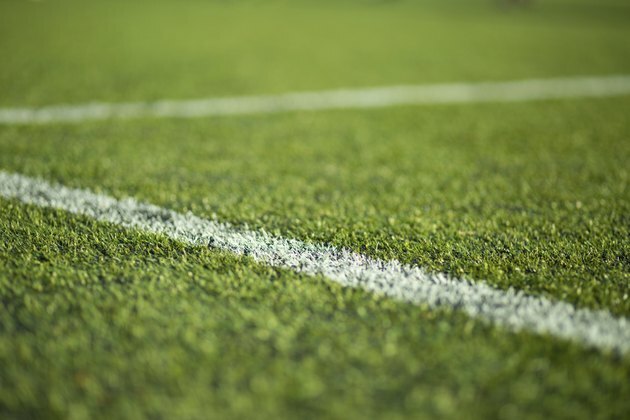 The STMA claims the average temperature of the surface of an artificial outdoor pitch can reach 117.38 degrees Fahrenheit, while soil only reaches 98.23 degrees Fahrenheit. What Color Golf Balls Are Easiest to Track?